Durban-based Southern African Shipyards (SAS) aims to cut steel on the new hydrographic survey vessel for the South African Navy (SAN) in Novembr 2018, with the expectation to have the skeg completed by the end of 2018. The Project is now on a fast-track programme, having successfully completed tank tests in Holland in September 2018. Southern African Shipyards was in late 2017 selected to build the hydrographic survey vessel for the SAN under Project Hotel after Armscor floated a tender in July 2014. Steel will be cut for this vessel early next year, with service entry in 2022, Gregory Delpaul, General Manager at Southern African Shipyards told defenceWeb. Local subcontractors on Project Hotel include Reutech (communications and four 12.7 mm Rogue machinegun turrets), Actom Energy and Veecraft (small boats). Cape Town-based Unique Hydra will be supplying the scientific mission payload. By using local companies, SAS is ensuring it meets the 60% local content requirement. The vessel is built to an ice-strengthened design by VARD Canada, a subsidiary of Italian based Fincantierri (formerly STX). It will be 95 metres long, have a width of 16.8 metres and be powered by a propulsion system delivering 7 800 kW and giving a top speed of 18 knots. It will have a 10 000 nautical mile range with 44 days endurance. Total crew will be 120, including scientists and crew. The hydrographic survey vessel “is probably one of the most complex vessels that has ever been built in this country. This is a vessel that scans the ocean floor…for mapping in the shipping industry. We chart the whole of the southern hemisphere” as one of South Africa’s commitments to the international community, Delpaul said earlier this year. The new hydrographic survey vessel will replace the SAS Protea, which has been in service since 1972. Project Hotel also includes two fully integrated inshore survey motorboats and the upgrading of current shore-based hydrographic office infrastructure at Silvermine. The South African Navy has ordered three inshore patrol vessels (IPVs) from Damen Shipyards Cape Town under Project Biro, but still has a requirement for three offshore patrol vessels (OPVs). 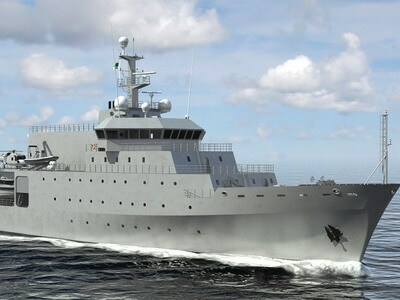 Delpaul told defenceWeb that SAS is offering an 85 metre design from Vard for this called the 7085 after the Vard 7 Series offshore patrol vessel range, even though the OPV component of Biro has been shelved for now. On the commercial side, SAS has almost finished a R1.4 billion contract from Transnet to build nine harbour tugs, and only has one tug left to finish – this should be completed around the end of the year. Delpaul said there are rumours that Transnet may acquire additional tugs. The 2014 tug contract was one of the largest shipbuilding contracts placed in South Africa and included construction of one of the world’s most powerful harbour tug, with a bollard pull of 100 tons. SAS previously built seven Voith Scheider tugs for the Transnet National Ports Authority between 2007 and 2011, and five Voith Schneider tugs for the same organisation between 1999 and 2003 under a partnership with SAFreight. SAS has between 200 and 400 employees and has the largest shipyard in Southern Africa consisting of 11 hectares with a useable water frontage of 300 meters. Its privately owned floating dock can accommodate vessels up to 75 metres in length. SAS is a 100% South African owned company and is 100% black owned and 67% black women owned. The employees of SAS own 12% of the company. Its facilities include undercover fabrication workshops with an area of 320 x 42 metres; build halls designed to hold vessels up to 140 metres in length; nine overhead cranes including two 30 ton cranes capable of a tandem 60 ton lift; a fully equipped pipe fabrication, mechanical and interior fit shop; stores with dedicated customs bonded holding area; 20 000 square metres of undercover workshop facilities and a 350×33 metre graving dock. Some of SAS’s projects include the construction of 14 super yachts for Oceanco, the construction of dozens of tugs, construction of a 48×78 metre pontoon, the refit of the SA Navy vessel Amatola and the refit, life extension and rebuild of many other vessels.